Wholesale pricing automatically updates in your cart. Need help with an even larger order? These are high quality foam. 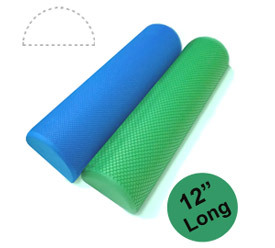 I use them for calf stretching (all my students need to stretch their calves! ), upper back support/chest opening and for sitting (to encourage forward tilt of the pelvis). Buy in bulk because your students will want to buy them from you! This muscle roller really helps me stretch my leg muscles well. A must have. I am a physical therapist and I needed half foam rollers for my patients. I ordered them wholesale and I am so happy. The quality is great. I injured my knee playing tennis and was anxious to get back on the court. My physical therapist had me using this roller for balance and I got one for myself. I got back on the court much faster than expected and I use it still and my game has even improved!